Trade union, community and political activist, member of CRADORA. One of the ‘Cradock Four’ murdered by the South African security forces in the Eastern Cape. Sparrow Mkhonto was born on 24 December 1951 in Cradock. He left school after Standard 8 (Grade 10) and worked for the Railways, where he joined the railway workers’ union. Mkhonto married his wife Sindiswa also from Cradock in 1972. They had one child, Lonwabo. Mkhonto lived and worked under trying conditions. The average wage of a railway worker in Cradock in 1983 was R242/month. He lived in a house where there were no amenities. Their bucket toilet was in a small shack outside the house. There was no electricity or hot water. The roads were rutted and untarred, with no storm water drains and no social amenities. The houses in Cradock had poor workmanship, there was little employment and people who had jobs did not earn a good living. Simmering discontent among the residents of the township led to the formation of the Cradock Ratepayers’ Association (CRADORA) and the Cradock Youth Association (CRADOYA) in 1983. Both organisations affiliated to the United Demoratic Front (UDF) in December 1983. Mkhonto became a senior office bearer of the Cradock Residents' Association. His involvement in the CRADORA and work in the railway union attracted the attention of the Security Police, who conspired with his employers to fire him on a spurious charge. On more than one occasion, Mkhonto was taken to the Cradock Security Police headquarters, where he was assaulted before being released. He made a statement about it to his lawyer, and laid charges against the police. The police never investigated. Later, his wife, Sindiswa Mkhonto was also fired from her job at a hair salon for being 'the wife of a communist'. On 27 June 1985, he travelled with Matthew Goniwe, Fort Calata and Sicelo Mhlauli to Port Elizabeth to attend a weekly UDF meeting. After the meeting, the four men left Port Elizabeth at about 21h10. The police set up a road block where they identified the cars carrying the Mkhonto, Calata, Goniwe, and Mhlauli. After they were intercepted and caught, Mhlauli and Mkhonto were transported in one car while Goniwe and Calata in another. The four men were handcuffed, separated and driven back towards Port Elizabeth under the impression they were being detained. Van Zyl, Taylor, Lotz, (security policemen) Mgoduka, Faku and an askari, (an African National Congress (ANC) guerrilla turned security policeman) and Sakati another black policeman later joined them. The convoy turned off at Bluewater Bay, near the Scribante race track. On 27 June 1985 all four men were executed by the security police and their bodies burnt. Van Zyl who shot Mkhonto claimed that he was alone with Mkhonto in the car and intended to take him to a remote place and stab him to death. While he was driving, Mkhonto, who was sitting in the seat behind him somehow managed to get his feet through his handcuffs bringing his hands in front of his body. He then allegedly tried to strangle Van Zyl from the back seat. Van Zyl reached for his gun on the floor of the car and shot Mkhonto in the head. He then pulled Mkhonto out of the car, shot him once again. Van Zyl ordered Faku to stab Mkhonto and burn his body. The families went to the Government mortuary in New Brighton, Port Elizabeth on 29 June, 1985, to identify the bodies of Mkhonto and Mhlauli. The families were only allowed to see the bodies from behind a glass panel. Both Mhlauli and Mkhonto were still handcuffed and tied with rope. On July 20 1985 the funeral for the Cradock four was held and mourners were addressed by Allan Boesak, Beyers Naude, Victoria Mxenge and Steve Tshwete. In addition a message from ANC leader-in-exile Oliver Tambo was also read to the tens of thousands of people who gathered. President PW Botha responded by declaring a State of Emergency in the Eastern Cape the next day (the following year it would be extended around the country). 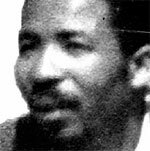 At the time of his death, Mkhonto was a soccer player, and president of a local soccer club. A two-year inquest into the death of the Cradock four began in 1987 (Inquest No. 626/87) under the Inquests Act No. 58 of 1959, headed by Magistrate E de Beer. At the end of the inquest on 22 February 1989, the Magistrate found that the four had been killed by “unknown persons” and that “no-one was to blame”. At the end of the inquest people exclaimed “kukudlala oku” which, in Xhosa, means “this is just a waste of time”, giving a clue as to how the local populace viewed the inquest. In 1992 President FW de Klerk called for a second inquest after the disclosure on 22 May 1992 by the New Nation newspaper of a Top Secret military signal calling for the "permanent removal from society" of Goniwe, Calata and Goniwe’s cousin, Mbulelo. The second inquest began on 29 March 1993 and ran for 18 months in terms of the Inquests Amendment. Judge Neville Zietsman, in delivering his verdict, found that the security forces were responsible for their deaths, although no individual was named as responsible. The Judge named police colonels Harold Snyman and Eric Winter, South African Police (SAP), and SADF officers Brigadier “Joffel” van der Westhuizen, Colonel Lourens du Plessis and Major-General Johannes van Rensburg as some of those who were connected to the murder of the Cradock four. In April 1996 the widows of the Cradock Four told the Truth and Reconciliation Commission (TRC) about their experiences at a hearing in East London. Seven men applied for amnesty for their involvement in murder of Mkhonto and his comrades. Amongst the applicants were five members of the Port Elizabeth Security Police, an army colonel and the notorious commander of the Vlakplaas hit squad, Colonel Eugene de Kock, known amongst his colleagues as ”Prime Evil”. A monument commemorating the lives of three generations of Cradock activists, who died during the struggle, including the Cradock Four, was unveiled by then-Deputy President Jacob Zuma and Eastern Cape Premier Makhenkesi Stofile. On 20 April 2006, the South African Government conferred the Luthuli Medal in Bronze on Mkhonto for his outstanding contribution and dedicating his life in fighting for a free and democratic South Africa.